Francis Pegahmagabow's medal set includes the Military Medal, with two bars, the 1914-1915 Star, the British War Medal 1914-1920, and the Victory Medal 1914-1919. Pegahmagabow was Canada's most decorated Aboriginal soldier in the First World War. Peggy, as his fellow soldiers called him, enlisted in August 1914 and went overseas with the First Contingent. He served for most of the war as a scout and sniper with the 1st Battalion, acquiring a fearsome reputation as a marksman. At the Battle of Mount Sorrel in June 1916, Pegahmagabow captured a large number of German prisoners and was awarded the Military Medal. 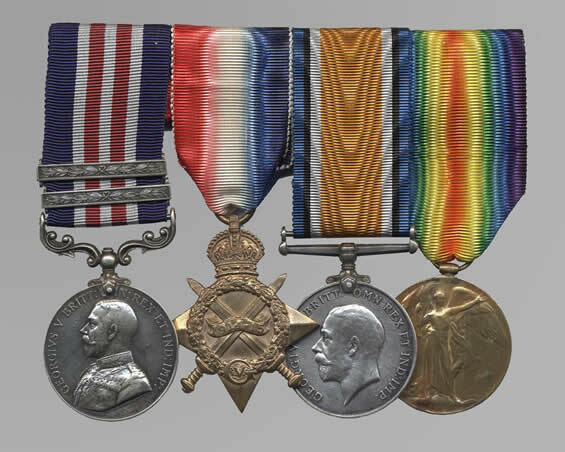 He was awarded a bar to his Military Medal during the Battle of Passchendaele in November 1917, and a second bar for actions during the Battle of Amiens in August 1918.